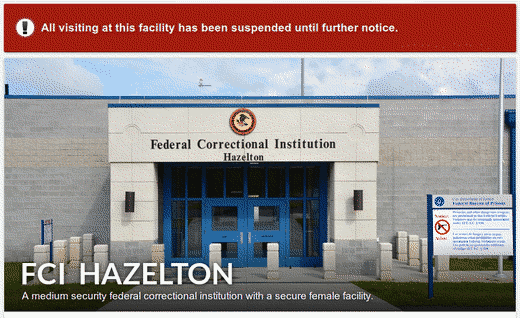 The high-security Federal Correctional Institution at Hazelton, West Virginia, site of the October 30 killing of former Boston gang boss James "Whitey" Bulger, has been closed to visitors. The prison's website contains a brief and unexplained notice: "All visiting at this facility has been suspended until further notice." The Federal Bureau of Prisons has not explained whether the visitation shutdown is related to Bulger's killing and has not indicated when the suspension will be lifted. While media reports have indicated that Bulger was choked and beaten to death by at least two Mafia-connected inmates from Massachusetts (and have provided specific identifications of those inmates), there has been little in the way of official news on the subject. We received word this morning about the death of James 'Whitey' Bulger. Our thoughts are with his victims and their families. The United States Attorney's Office and the FBI are investigating the death of James Bulger as a homicide. To protect the integrity of the investigation, no further details will be released at this time. Bulger was eighty-nine years old and serving two consecutive life sentences for murders, racketeering and other offenses. He was found unresponsive in the penitentiary at eight-twenty, Tuesday morning, October 30. Prison staff attempted life-saving measures. Bulger was pronounced dead by the Preston County Medical Examiner. Bulger arrived at the prison following a transfer one day earlier. He was sentenced five years ago after a summer 2013 trial in Boston, Massachusetts. He was a fugitive between 1995 and 2011. 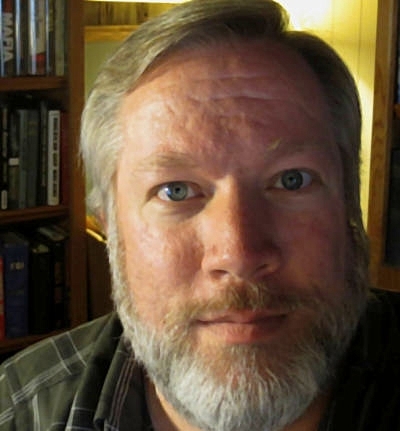 He was arrested in California in 2011. 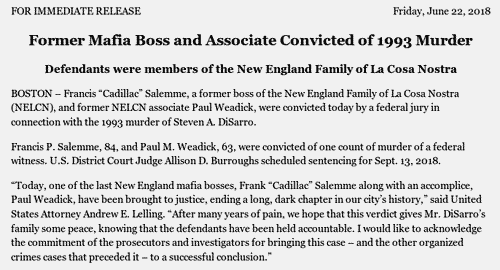 In the 1980s, while engaged in his own illegal activities, he secretly aided federal authorities in dismantling the Mafia organization in the Boston area. The Hazelton facility houses 1,270 male inmates. It has experienced a string of violent attacks. Bulger's killing was reportedly the third homicide inside the facility in the past seven months. An official of the guards union at the prison told the press that Hazelton is dangerously understaffed. He said the prison currently has seventy-seven job vacancies, with more than half of those for guard positions. James "Whitey" Bulger, longtime Boston underworld figure, was found dead Tuesday, October 30, within a high-security penitentiary in Hazelton, West Virginia. Sources indicated that Bulger was "killed." Federal authorities are investigating the circumstances. The New York Times, citing two unnamed Federal Bureau of Prisons employees, reported that at least two inmates beat Bulger to death. The Boston Globe reported that the prison in Hazelton has experienced a string of violent attacks. Two other inmates were killed in fights at the understaffed institution earlier this year, according to the Globe. Bulger was found unresponsive at 8:20 a.m. Efforts were made to revive him. 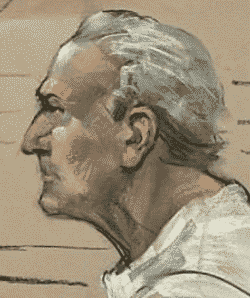 Eighty-nine-year-old Bulger, sentenced to two life prison terms after being convicted of involvement in eleven murders, had only arrived in Hazelton on Monday, October 29. He was transferred from a prison in Florida and held for a time at a transfer facility in Oklahoma City. 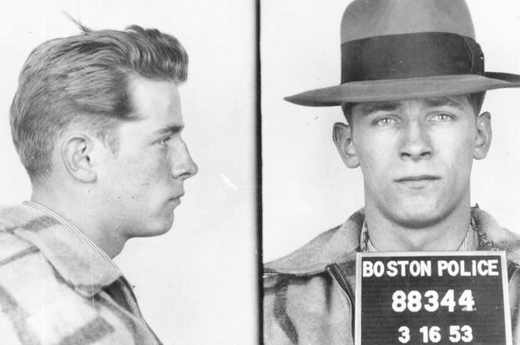 Bulger was part of South Boston's Winter Hill Gang. 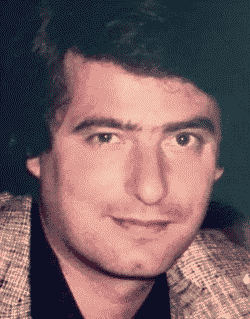 While engaged in his own illicit rackets, he fed information to the FBI about Mafia rivals and assisted in the dismantling of the Angiulo Mafia organization in Boston in the 1980s. His cooperation with federal agents provided him with protection from prosecution for more than a decade. When authorities finally were poised to arrest Bulger early in 1995, he was apparently tipped off and vanished. The indictment against him included charges that he participated in nineteen gangland killings. FBI corruption was revealed in 2002, when Bulger's handler, John J. Connolly, Jr., was convicted of racketeering and obstruction of justice. 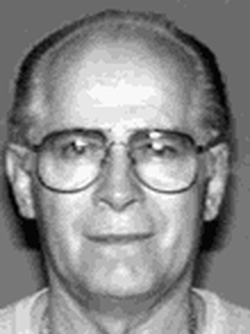 Bulger quickly earned the top spot on the FBI's Most Wanted List. The government reward for information leading to his arrest reached $2 million in September 2008. A worldwide search (there were reports that Bulger might have fled to Sicily) ended on June 22, 2011, with Bulger's arrest in California. He had been living in Santa Monica with his longtime companion Catherine Greig. Agents found $800,000 in cash and more than thirty firearms hidden in their apartment. Catherine Greig pleaded guilty to helping Bulger elude the police. She was sentenced in 2012 to eight years in prison. She remains behind bars in Minnesota. Bulger came to trial at Boston's federal courthouse in June 2013. The jury concluded five days of deliberations on August 12, 2013, finding Bulger guilty of racketeering offenses and participation in eleven murders. On November 14, 2013, he was sentenced by federal Judge Denise J. Casper to two consecutive life sentences plus five years. 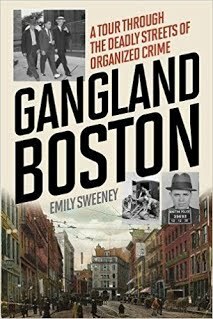 Born September 3, 1929, in Dorchester, Massachusetts, Bulger grew up in a South Boston housing project. His criminal activity started at an early age. He was arrested in 1956 for bank robbery. Following conviction, he was sentenced to twenty years in prison, but served just nine years. When he emerged from prison, he became a key member of the Winter Hill Gang. A younger brother, William, went into politics and became a longtime leader in the Massachusetts State Legislature. "Crime lord Whitey Bulger appears in LA court, remanded to Massachusetts," New York Post, June 23, 2011, nypost.com. 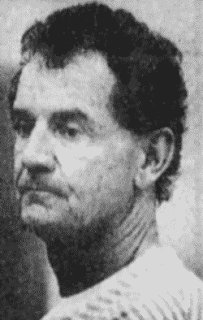 "Fugitive Boston mobster arrested on Westside," Los Angeles Times, June 23, 2011. "James 'Whitey' Bulger killed in West Virginia prison, sources say," WCVB-5 Boston, Oct. 30, 2018, wcvb.com. 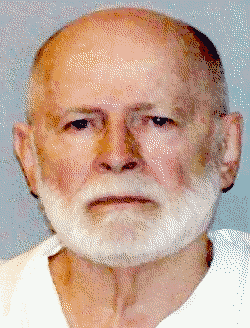 "Whitey Bulger, galpal nabbed in California," Boston Herald, June 23, 2011. Butterfield, Fox, "F.B.I. agent linked to mob is guilty of corruption," New York Times, May 29, 2002, p. 14, nytimes.com. Harvey, Matt, "Update: U.S. Attorney Powell in WV...," WVNews, Oct. 30, 2018, wvnews.com. Kennedy, Helen, "Boston mobster James (Whitey) Bulger spotted in Sicily?" New York Daily News, Sept. 15, 2007, nydailynews.com. Ivory, Danielle, and William K. Rashbaum, "Whitey Bulger said to have been killed by inmates in prison attack," New York Times, Oct. 30, 2018. McFadden, Robert D., "Whitey Bulger, notorious Boston mobster and informant, is dead at 89," New York Times, Oct. 30, 2018, nytimes.com. 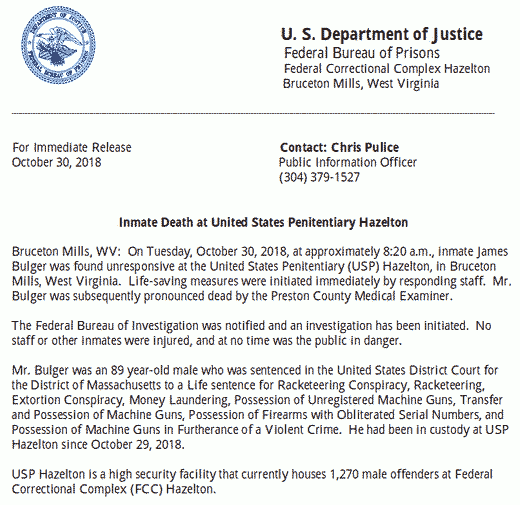 Pulice, Chris, "Inmate death at United States Penitentiary Hazelton," U.S. Department of Justice, Federal Bureau of Prisons, news release, Oct. 30, 2018. Rocheleau, Matt, and Emily Sweeney, "James 'Whitey' Bulger's killing is just the latest in a string of troubling violence for W.Va. prison," Boston Globe, Oct. 30, 2018, bostonglobe.com. 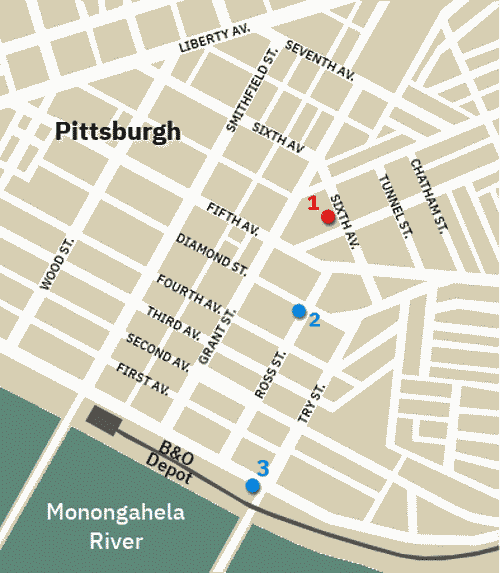 1 - Location of the Scalise residence on Sixth Avenue in Pittsburgh. 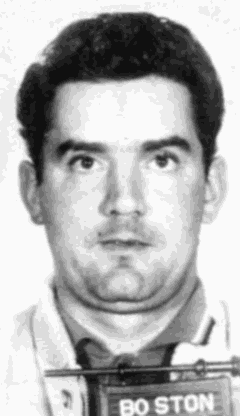 2 - Frank Yacca is arrested by special officers near the city morgue. 3 - A railroad employee spots a suspicious man at the B&O Railroad yard. "Get up! We have come to kill you," a man called out. Peter Scalise was shaken to consciousness. It was about nine o'clock in the evening of December 4, 1904, and Scalise already had been in bed at his sister Louise's Pittsburgh home, 546 Sixth Avenue, for about an hour. 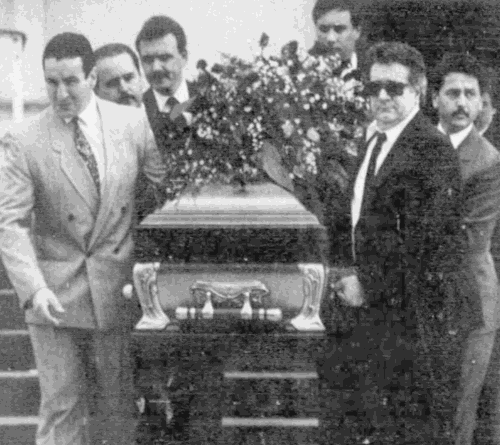 The twenty-year-old Sicilian stone carver opened his eyes and found himself surrounded by three Italian men, killers belonging to a criminal society that had followed him through several states. Pittsburgh Post, Dec. 5, 1904. This "rude awakening" of Peter Scalise provided the public a rare glimpse of an interstate Neapolitan criminal network operating in the United States. Scalise let out a scream for help as the intruders pulled out knives and began stabbing and slashing at him through his heavy winter blankets. His sister and a cousin, who were visiting with neighbors, heard the scream and rushed to his aid. They entered the bedroom and grappled with the knife-wielding attackers, suffering blade wounds to their hands and wrists but continuing a determined fight. Scalise, wounded more than a dozen times (some accounts said eighteen times, while others claimed more than twenty) and losing blood through slashes on his chest, legs and forehead, rose from the bed to engage one of his assailants. Grabbing at the man's knife, Scalise suffered a hand wound that nearly cost him his left thumb. The would-be killers, perhaps discouraged by their loss of numerical advantage or perhaps concerned that the police would soon appear, withdrew, fled the building and ran off into the chilly night (it was just below freezing). Peter Scalise, wearing only his underclothes, pursued the men toward the Monongahela River along Ross Street. That route caused the men to pass in front of several city buildings, including the jail and the morgue. Near the corner of Ross and Diamond Streets, Scalise collapsed to the pavement and shouted for police. Two special officers of the police, John J. Dillon and John McDonough, responded by grabbing one of the fleeing men, Frank Yacca, sixteen years old. They immediately brought him to the fallen Scalise, who identified Yacca as one of the three men who tried to kill him. Yacca was dragged off to the police central station, while Scalise was taken for treatment to Homeopathic Hospital on Second Avenue near Smithfield Street. Scalise's wounds were ugly but, likely due to the protection afforded by the thick, dense blanket, they were not life-threatening. A short time later, Dispatcher Hugh O'Donnell of the Pittsburgh Railways Company, spotted a suspicious person around Try Street near the Baltimore & Ohio Railroad yards. O'Donnell went after the man but lost him in the railyard. At the hospital, Scalise gave a description of the two assailants still at large. He also provided police with an explanation of the attempt to murder him. Scalise said he committed some offense against an Italian criminal society known as "Camorra." While a resident of Boston, Massachusetts, a death sentence was passed against him. New York Tribune, Dec. 5, 1904. Learning of his situation, Scalise traveled west to Chicago. The Camorra discovered his presence in that city and plotted his murder there as well. Apparently benefiting from some inside sources, Scalise was alerted to the threat in time to depart Chicago for Pittsburgh. Fearing for his life, Scalise seldom left his sister's residence. But the Camorra killers eventually followed him to the western Pennsylvania city and all the way into his bedroom. Believing that Scalise might provide some useful information on the increasingly troublesome Italian underworld societies in the Pittsburgh area, Police Superintendent Alexander Wallace took personal charge of the case. Scalise's sister and cousin were taken into custody as material witnesses (one early local report suggested that they were arrested as suspects in the stabbing of Peter Scalise). They were locked up in a cell opposite the one occupied by suspect Frank Yacca. 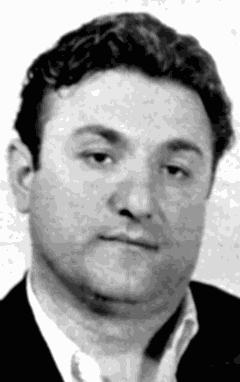 Special Officer Peter Angelo, an Italian American, was secretly positioned nearby. According to published accounts, the special officer overheard Yacca making threats against the witnesses. He told them that if they dared to testify against him, his friends in the Camorra would kill them. Note: The local press provided little in the way of updates to this case - odd, considering the national interest the story generated when first reported. But a Sunday supplement article from a West Coast newspaper months later included the attempted murder of Scalise in a collection of reported "Black Hand" extortion crimes. The article stated that $5,000 had been demanded from Pietro and Luise [sic] Scalise of Pittsburgh. Brandenburg, Broughton, "The spread of the Black Hand," Los Angeles Herald, Sunday Supplement, June 25, 1905, p. 1. "Aroused from sleep to be killed," Mount Carmel PA Item, Dec. 5, 1904, p. 3. "Camorra pursued Sicilian," New York Tribune, Dec. 5, 1904, p. 1. "Italian was stabbed in fight," Pittsburgh Press, Dec. 5, 1904, p. 1. "Incurred enmity of the Camorrata," Elmira NY Gazette and Free Press, Dec. 5, 1904, p. 8. 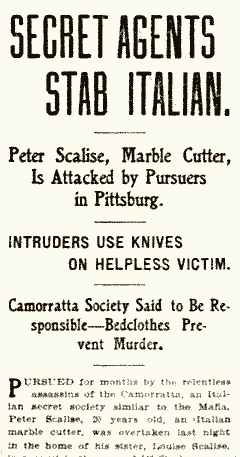 "Secret agents stab Italian," Pittsburgh Post, Dec. 5, 1904, p. 1. "Waked him and said: 'Get up we have come to kill you,'" Detroit Free Press, Dec. 5, 1904, p. 1.